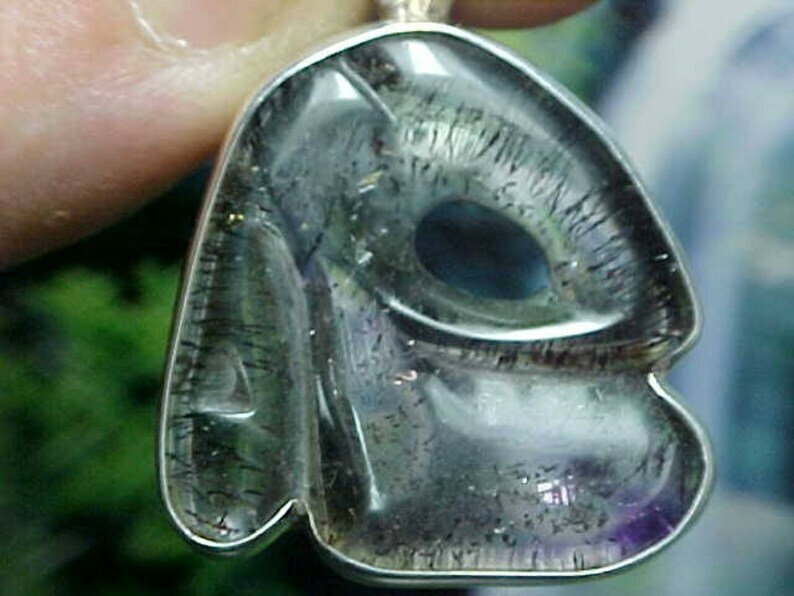 This listing features this amazing, hand carved Rabbit of Agape Crystal and Sterling Silver pendant which measures 1 3/8x1" including the bail. When we take a closer look at the Agape Crystal under the light, we see that this gemstone is predominantly a light Smokey Quartz with darker phantom rings, intermittent clear zones and a streak of Amethyst, as well as fine filaments of Rutile and luscious, ruby-red Lepidocrocite. Hand-carved by Dino, this Agape Crystal has the shape of a rabbit's head with an open eye and long floppy ear. 2011 is the Year of the Golden Rabbit in Chinese astrology, and is (according to Chinese tradition) the year in which you can catch your breath and calm your nerves. It is a time for negotiation. Hand-crafted and set into an open bezel by Dino, this unique Rabbit will make a fine addition to your collection of "one-of-a-kind" Agape Crystal jewelry. You will receive the exact pendant pictured here, along with a purple keep-sake bag, a postcard size photo of our Agape Crystals being bathed in crystal-pure, natural springs here in our beloved Ouachitas, and a signed certificate, as our promise that you have purchased a genuine Agape Crystal pendant. RABBIT has long been associated with the Fairy Realm, and following a "white rabbit," Alice found her way into a wonderland of magic and fantasy. Rabbit is found in almost every part of the world, in stories, legends and mythology, and in addition, is one of the animal totems of the Chinese zodiac. Rabbit has also come to represent speed, agility, and new life, and occasionally will teach us that sometimes it is necessary to call our "lessons" to us in order to grow in knowledge and understanding.